The area I grew up in is in the news in the UK this week. There are to be major job losses at the steel works in Port Talbot, where my mother, father, and grand-father worked. My dad was an engineer there, and my mother was a computer (at least until she married by dad and started their family.) I never met my grand-dad, he died before I was born, but he was an engineer at the steel works during its establishing years, who earned an MBE working on refining the steel-making processes there. It is literally the crucible of my family, and massive part of the psycho-geography of my early life. It is a huge industrial site, that dominates not only Port Talbot but can be seen for many miles – lit by flame and sodium-light at night, perched on the coast of Swansea Bay. From the highlands surrounding – the rather-grandly named ‘Margam Mountain’ you can see it nestling/infesting the border between biomes – sandy, scrubby dunelands and lush welsh ‘rainforest’. 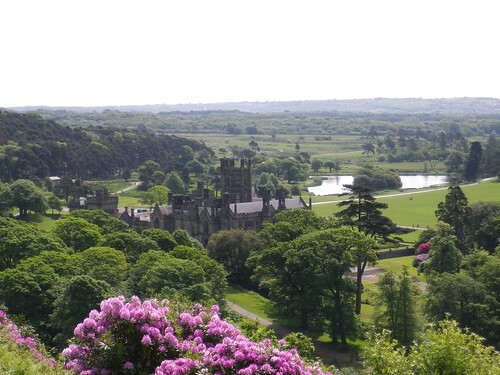 Glance to the left and you see Margam Castle, the grounds of which my mother and aunt grew up in – daughters of the Talbot family butler. 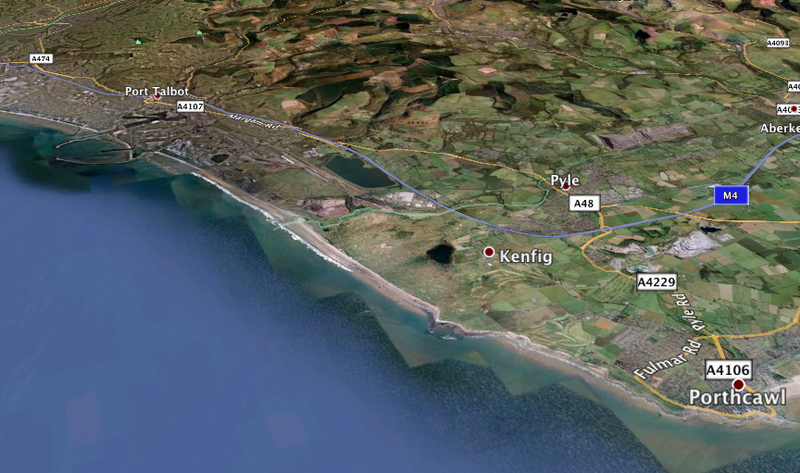 You can also see the sands of Kenfig, and the lake at the centre of the nature reserve (a ‘SSSI’ – Site of Special Scientific Interest) – where I spent many weekends as a child in the early 1980s as part of a nature conservancy group for kids. The lake has legends associated with it – most notably that of a sunken city beneath it, but the formation of the lake and the dunes has more to do with changing tides, climate and the forces they can wield. And now, changing tides of capital and globalisation are at play on the landscape. I wonder if subliminally I learned something about the history of power and landscape. Something of the disregard the rulers of the industrial age held for the environment, contrasted against the deep romantic love for nature from those who worked for them. It’s more complicated than that though – not as clear cut. Something as big as the steelworks becomes a force of nature, both in its impacts on the local ecosystems – and symbolically. There’s a walk from Redcar into Hartlepool … I’d cross a bridge at night, and walk above the steel works. So that’s probably where the opening of Blade Runner comes from. It always seemed to be rather gloomy and raining, and I’d just think “God, this is beautiful.” You can find beauty in everything, and so I think I found the beauty in that darkness. The steelworks imprinted something like this on me early – perhaps not beauty, but majesty in the industrial. The news this week is very sad – overwhelmingly for the people and their livelihoods that it effects. Environmentalists probably won’t mourn the passing of the steelworks, but those of us who find ‘beauty in the darkness’ might. Given to me by my Paul Peter Piech as I left for the Welsh School of Architecture in 1990. My Dad found it and gave it back to me last time I went home to Porthcawl. Honoured that he chose to sign it “Uncle Paul” – he was a great friend to my father and a great influence on me. It goes on to describe the way he worked – which I remember well. Prolific doesn’t begin to describe it. He spent most of his time in his studio working, but he often visited my dad in his framing workshop, or the printers where I worked. He would come in to get enlargements on the photocopier, copies from books – art, design, philosophy, politics, and he would always explain to me what he was doing with them, even though I was just a spotty 15 year-old printer’s devil. “Piech did not crave the perfect studio. He was happy to work in garages. In his series of suburban homes, in Middlesex, Herefordshire and Wales, he would spend evenings cutting his lettering direct on to the lino, whilst keeping one eye on Coronation Street. It was a family joke that Christmas Day ended at 10 in the morning. Once the presents were open Piech went back to his proofs. His fellow printer and writer Kenneth Hardacre once described the urgency of Piech’s output as that of “a man whose need to communicate his faith and his fears was so pressing that it often appeared to be impatient with the very means he had chosen for expressing that need”.